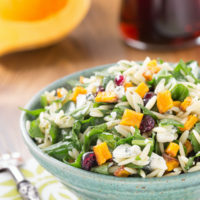 Butternut squash orzo salad is a lighter fall salad recipe with spinach, orzo, Craisins and Gorgonzola cheese, topped with a creamy maple vinaigrette. The holidays are coming, and I’m pretty sure I’ll be indulging a bit more into sweets and other higher calorie food. 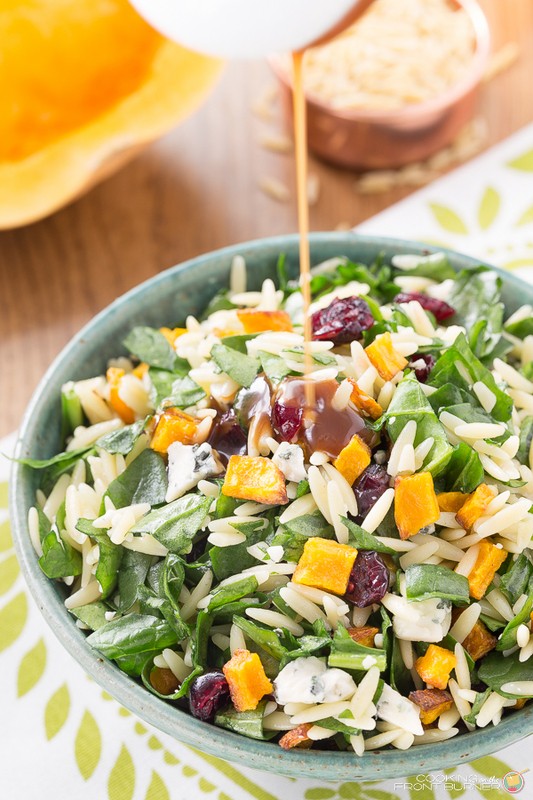 I’ll be trying to balance it out with some healthier foods and that is where this Butternut Squash Orzo Salad with Maple Vinaigrette comes into play. 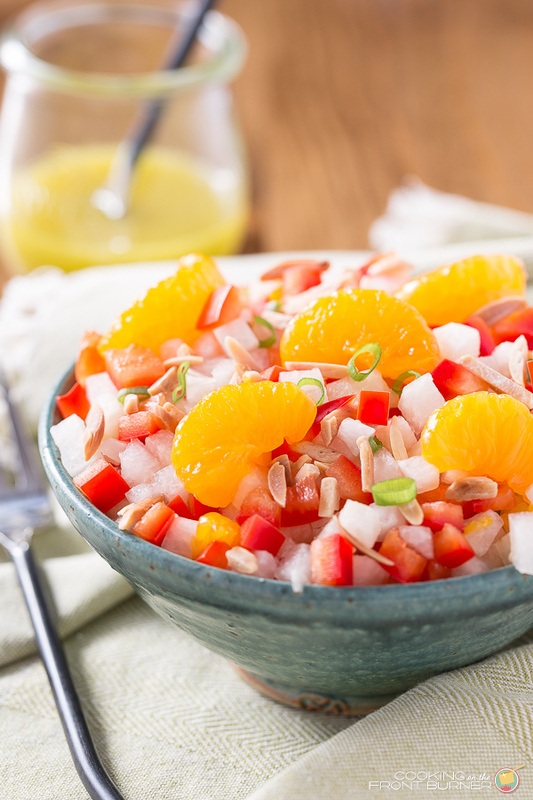 It’s a light and refreshing salad, perfect for lunch or as a side dish. Butternut squash is available right now, so it’s fun to come up with new recipes for the palate! 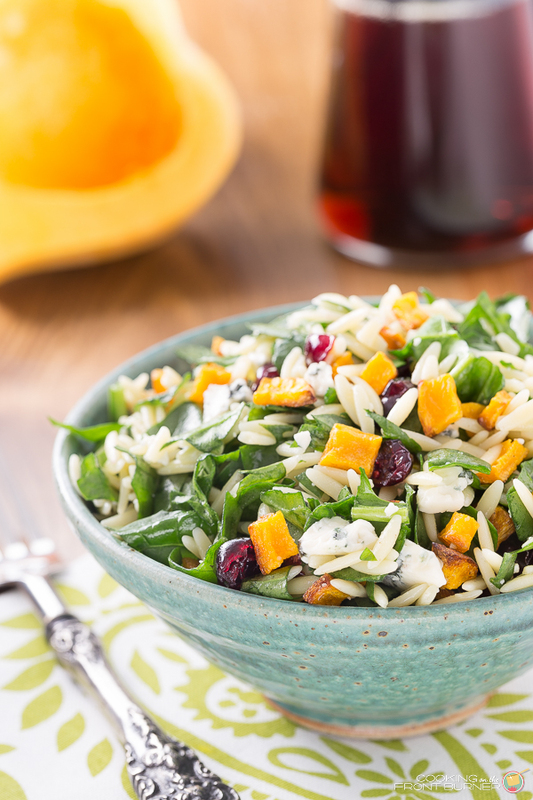 What’s not to love about a healthier salad with fresh spinach, orzo, craisins, roasted squash, tangy gorgonzola and a creamy maple vinaigrette dressing? 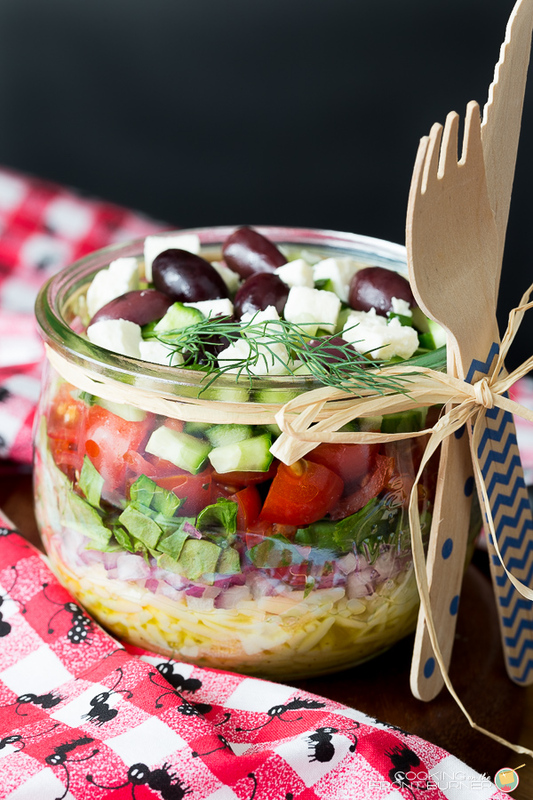 This pasta salad recipe is quickly becoming one of my fall favorites. 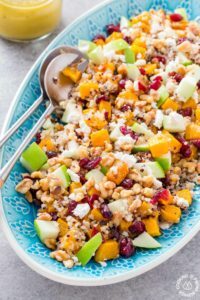 So, say you are asked to bring a side dish to your next holiday gathering and you show up with this colorful butternut squash salad. I think your host would be pretty pleased. 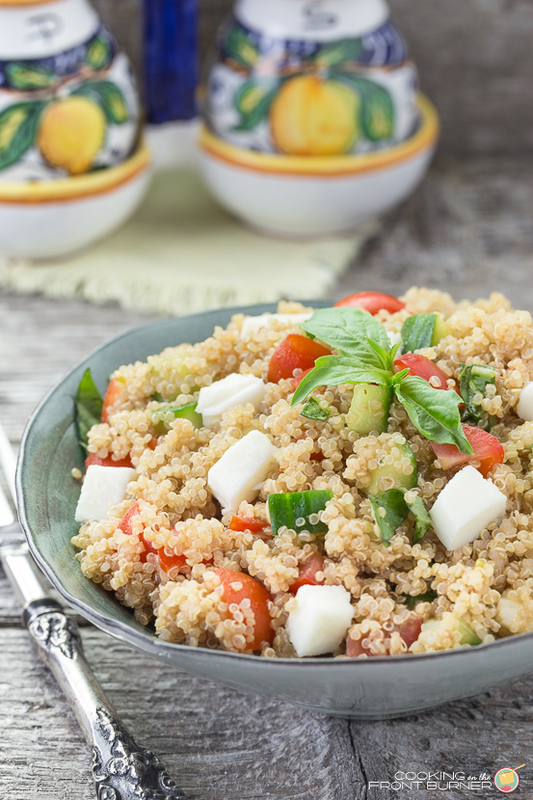 Another variation I thought of afterwards is using quinoa instead of the orzo pasta, to add some whole grains. I’ll be trying that sometime soon too! Another dish that has been a hit is Roasted Butternut Squash with Cranberries. It has such a sweet and tangy flavor. 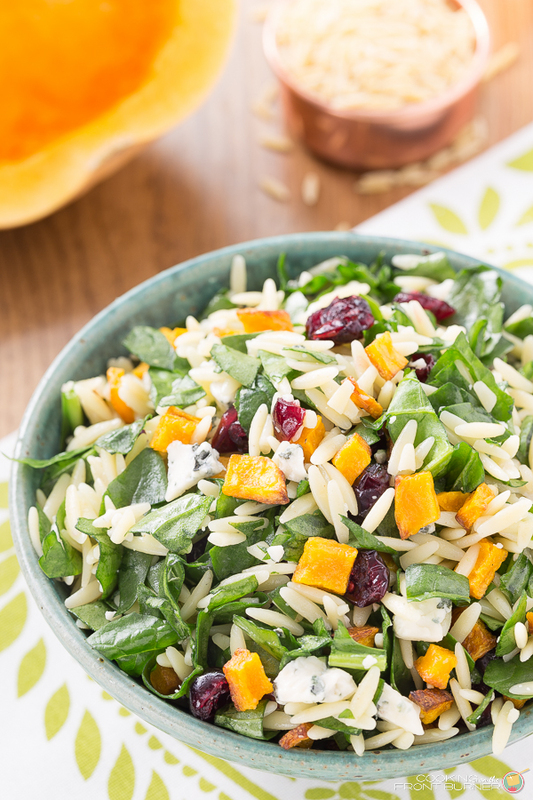 I hope you enjoy this butternut squash orzo salad recipe! Cutting butternut squash can be a bit time consuming. Once I peeled it, I cut in half vertically and used my mandoline on the 1/4″ setting to cut slices and then from there, I used a knife to cut the cubes. I ended up not using all the dressing. Feel free to add in as much as you think you’ll want, and save the rest to use on a green salad. 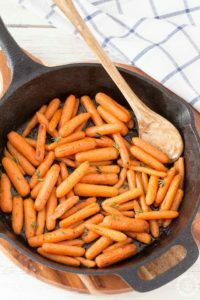 You will love this side dish salad with any meal! This is a beautiful salad! I love that you used gorgonzola in it and paired it with the butternut squash–I bet it goes together so nicely. Thanks Julia. The Gorgonzola gives it a nice tangy taste! What a great idea to use squash in a salad! The dressing sounds perfect. So many wonderful flavors in one bowl. Maple and butternut squash are a match made in heaven. What a perfect fresh Fall salad! Thanks… We really enjoyed it! 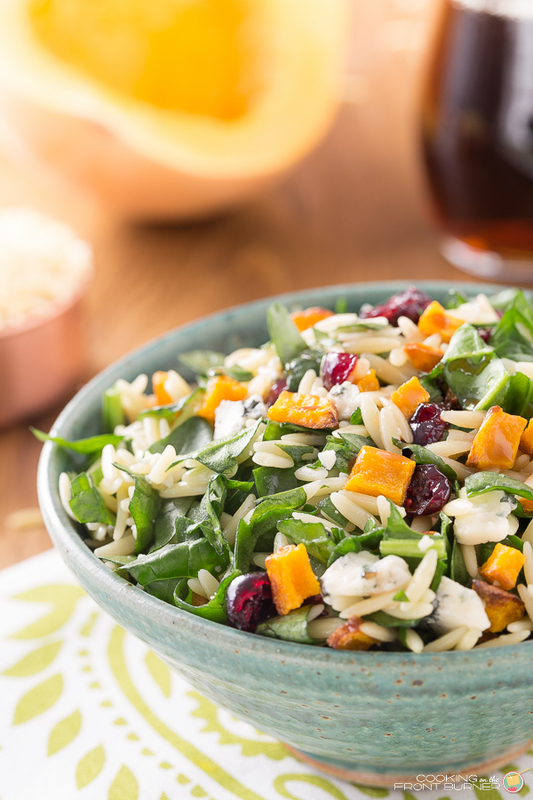 What is it about butternut squash and craisins….oh, and gorgonzola! Seriously – these are the perfect flavors together!!! Wow that looks so good, colorful and healthy! Butternut squash must be one of the BEST squashes. It gives your salad a great bright pop of color. So fresh and healthy – love all the colors and textures! Wow this looks good!!!! I'll be trying this soon, I have a feeling. 🙂 I am stopping by from Totally Terrific Tuesday…nice to meet you, Deb! This sounds absolutely delicious and is a perfect dish for this time of year. Thanks so much for sharing your recipe on "Best of the Weekend." 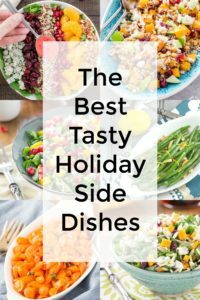 I'll be featuring you dish for this week's party. We are always looking for new butternut squash recipes! This looks so delicious…I cannot wait to try it! 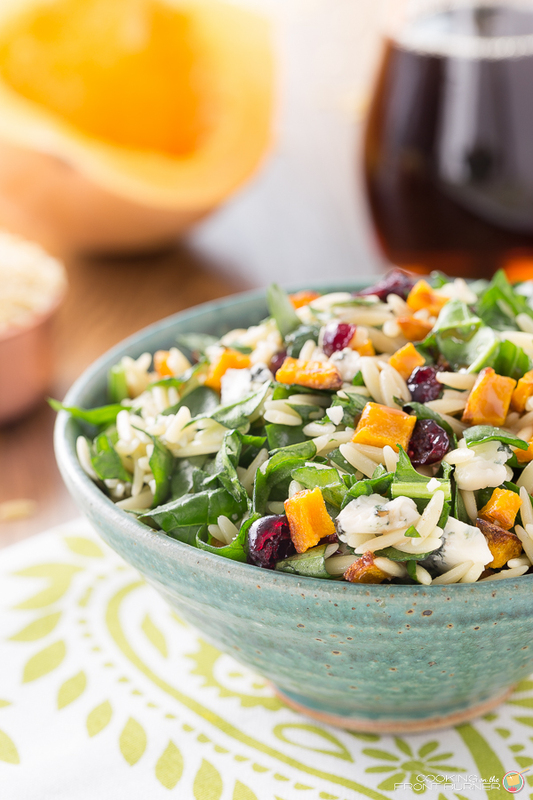 Yes to all things orzo! I love how you added butternut squash to this! Gorgeous, and I cannot wait to try this! I'm going home with more than a few butternut squash from my dad and mom's garden today! 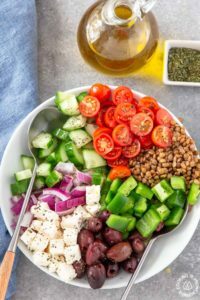 This salad is the way I love to eat! Beautiful colors and flavors — I'd be happy with a big bowl of this!